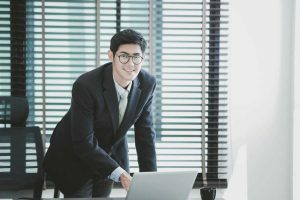 Do you want to learn what the real benefit of standing while working are? You can find out with the Vivo Height Adjustable Standing Desk. This product is a monitor riser that is quick to set up and easy to use. There are no confusing instructions to worry about because it is simple, with minimal assembly needed. Adjust it to a height comfortable for you and lower it down in an instant when you want to sit; this is possible because of the dual gas spring force that has a locking mechanism. It has 8 height options that adjust from of 6.5” to 16”. Meanwhile, the surface area has dimensions of 36” to 22”, giving you enough space for your computer and other accessories. In fact, you can also place dual monitors above because the desk can handle up to 37.5 lbs. 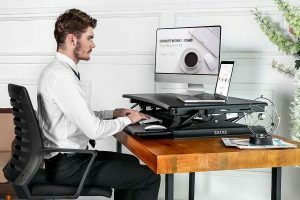 For a better working experience, the Vivo Height Adjustable Standing Desk has a separate lower deck where the keyboard and mouse should be put. Coming with a durable steel frame in a black finish, this innovative desk will be the newest trend in your office. The Vivo Height Adjustable Standing Desk is a monitor riser that will transform your workstation. 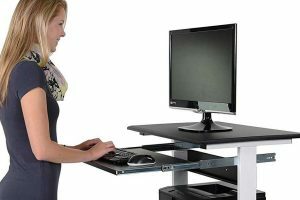 It is one of the best standing desks on the market today because of its quality and affordability. People have been commending it for being user-friendly. Find out why it has been receiving positive reviews by reading on. Whether you are sitting or standing, this monitor riser is a great choice because you can immediately adjust it whenever you want to. The gas spring rise smoothly transitions upward or downward and locks the desk in place. 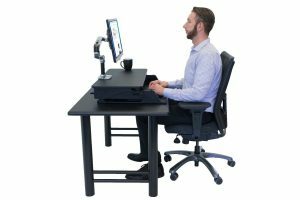 You will not experience shaking while typing thanks to the counterbalance tension that adjusts to the weight of your desk. The product is designed with 8 height options, providing you more choices that the other brands. You can adjust it from a height of 6.5” to 16”. It has enough room for a dual monitor, too. 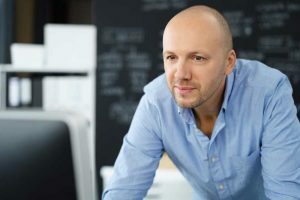 Aside from the 32” wide surface area, there is a lower deck for your keyboard and mouse, as well as a small storage tray for cellphones, pencils, and tumblers. The weight capacity is 37.5 lbs., so you can safely set up all the things that you need on your desk. While other standing desks are not as sturdy, this product does not seem to have a problem with that. According to reviews, the standing desk is stable, even at full extension. It is strong and has non-slip pads on the base. 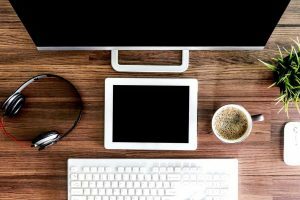 You can choose to use a grommet or C-clamp mount which will allow you to get more desk space and keep your monitor secure. 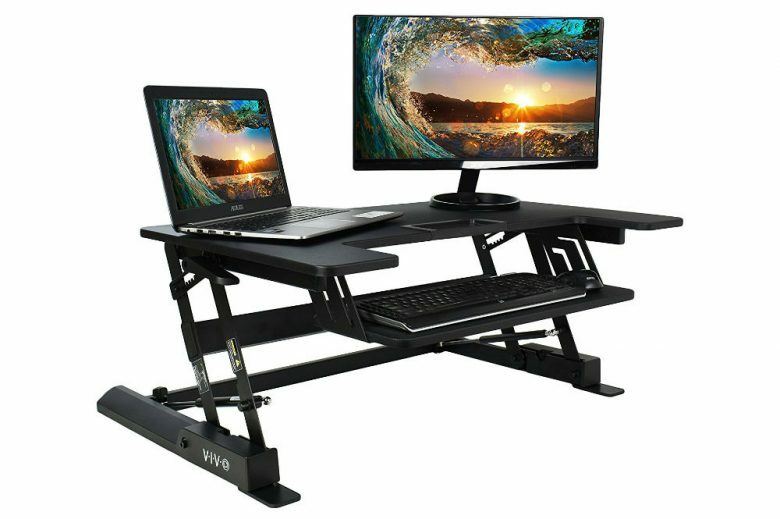 Although this Vivo standing desk has received many good comments, some users have reported that the keyboard tray or the lower desk is not that sturdy. The screws do not hold to the pressed wood. Others think that the surface area is rather small for two monitors. Some even complained that there is no room for the arms to rest. Moreover, it is also not recommended for people taller than 6’, nor to use as a single desk alone because it will be too low and won’t be that stable. No standing desk or monitor riser is perfect in the eyes of all. Just like other brands, the Vivo Height Adjustable Standing Desk also has a few negatives. 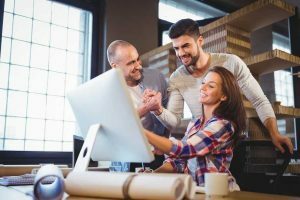 However, it is great enough for most people looking for an affordable standing desk for their home or office. Just make sure to carefully follow the instructions for setting it up to enjoy a sturdy desk while sitting or standing. Overall, this standing desk is still a great choice.